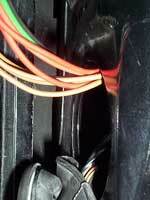 The wiring harness must be routed through the kick panels to reach the rubber boots in the door jamb. The passenger side is easy. Once the panel is removed there is a clear shot. 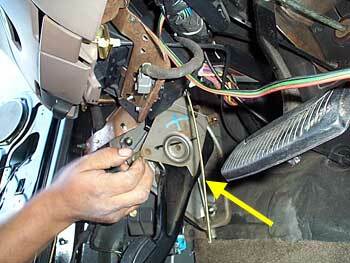 On the drivers side, our installer had to reach up and around the parking brake assembly to get to the access hole. 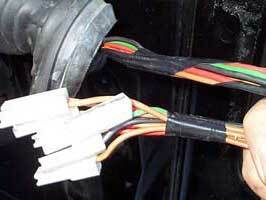 Our installer removed the rubber door jamb boot and pushed a fish tape through to the inside of the truck where he taped the wires to the tape and pulled it through. The yellow arrow points to the fish tape hanging under the dash. Once the wires were through to the door jamb, they were routed through the rubber boot and into the door.